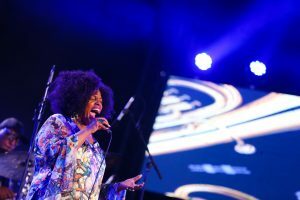 Safaricom Jazz Lounge came our way again this October 18th with the Award Winning Dianne Reeves, who was supported by Italian band Ad Hoc and Kenyan Kato Change. This time, the very well organized concert was at Uhuru Gardens, and I must say that it was the first time I was watching all three performers. For that reason, it was quite entertaining for me, as I was curious about all three. And none of them disappointed! As always all brought entertained from their hearts and it is always good to see that they seemed to enjoy the music as much as we all did. I was afraid of the rains and mad but none of that happened, as the heavens respected the night. 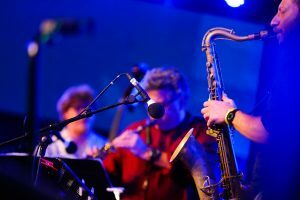 As always, a picture tells a thousand words and below is the magic of Jazz Music told in thousands of words if the pictures are anything to go by. 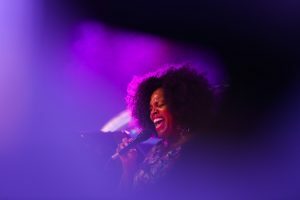 Above, Dianne Reeves feeling the music as much as we the audience were feeling it. The headline star Dianne performed right from the depths of her soul and it was quite evident. The Italian Band Ad Hoc made some magic music as we waited for the headline start of the night Dianne. The Change Kato who struck me as very down to earth all the times we met before, during and even after Uhuru Gardens. More of Dianne Reeves. It is evident how she sung from the very depth of her soul. As always all the proceeds of Safaricom Jazz go to the community project Ghetto Classics and I had had the pleasure of spending an afternoon with the beneficiaries of the rather harsh environment. I did not manage to speak to a whole lot of the kids as they were busy on their instruments but I did get to speak to Lewinsky Atieno and Stephen Ogoma. Here are their stories – powerful stories of young ones who among others have been offered a way of life thanks to Safaricom jazz. The two were among the privileged ones who had traveled to Poland courtesy to Jimek and the Brave project. Here are their stories. Dianne Reeves and crew also went to visit the kids and to listen to them and was touched to the core. Because the stories that come of that place touch everyone who visits to the core. How did Ghetto Classics come to be? 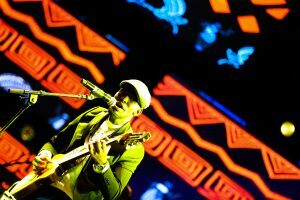 In a beautiful twist, Safaricom Jazz went to Hell’s Gate for Jazz and in the park. I was in attendance and that was quite something! Dianne composed her music on the go of how we have it going to have such beauty in Kenya. Dianne incorporated the beauty and privilege of Kenya in her music quite effortlessly. Java House Continues With Its Expansion In Nairobi By Opening Its 59th Branch In East Africa.What Happens When An Insurance Comes To You?